Looking for a home on a private or public golf course in the Vail Valley? Well, then, buyers have a huge inventory of choices for either a permanent home or a second vacation home. With over hundreds of homes for sale in all of the Vail Valley's golf communites, the interested buyer can choose from as low as the three hundred thousands to over five million dollars. Here are the names of some of the Vail Valley's most prestigious golf courses: Red Sky Ranch in Wolcott, the Sonnenalp in Edwards, Beaver Creek Golf Course in Beaver Creek, Eagle-Vail Golf Course in Eagle-Vail, Eagle Ranch in Eagle, Cordillera Golf Course in Edwards, and Country Club of the Rockies in Edwards. For real estate information on homes in any of our beautiful golf course communities, see my contact information. Spring time is here in the Rocky Mountains!? (even though it will snow tomorrow)? 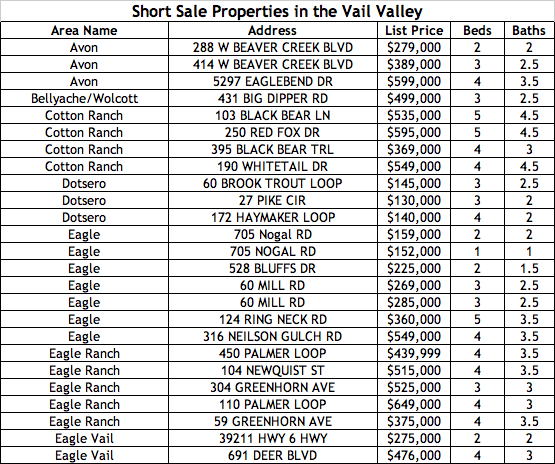 Eagle and Eagle Ranch are seeing continuing high?levels of real estate activity here in 2011.? While skiers are getting in their last runs for the season, Eagle is gearing up for mountain biking and golfing.? (The Eagle Ranch golf course is OPEN for the season!)? 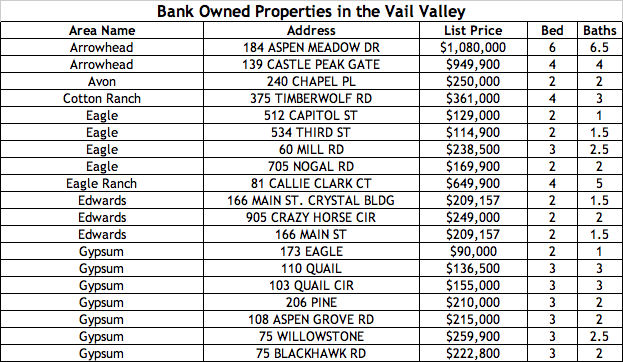 Eagle and Eagle Ranch are accounting for a significant percentage, over 16%, of all transactions for the entire Vail Valley. There are currently 44 active residential listings and 34 homesite listings. There are 16 residences under contract and 2 homesites under contract. There have been 22 home sales since 1/1/11 and 2 homesite sales. 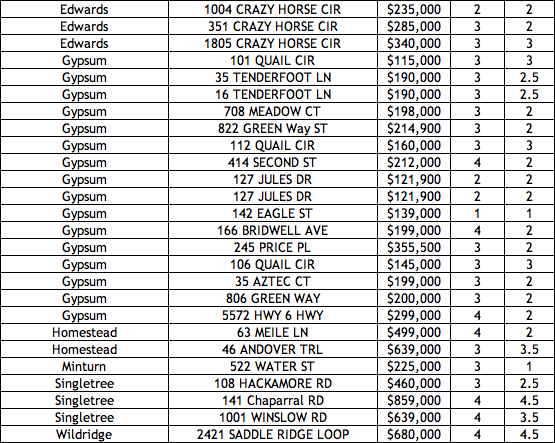 For more information on these properties please call Gateway at 970.790.6777 or 970.926.6777. Sleepy Hollow Ranch is a spectacular property located at the south end of Brush Creek Valley,?that borders White River National Forest, Sylvan Lake State Park and BLM land.?? The property features 87 lush acres, with a 1/4 mile?of? Brush Creek running through the property.? ?This property has it all - a gorgeous valley, dramatic hillsides, trout filled stream and views of Castle Peak.?? ?The?2,000 square foot ranch?house has been recently remodeled and is nestled?amongst the towering pines.? In addition, a guest cabin, tack barn and significant?water rights are all a part of this extraordinary ranch.? The opportunities for activity and nature are endless.? ?Offered for $2,175,000. Buying Opportunities in Eagle Ranch's Aidan's Meadow! Aidan's Meadow is a great?neighborhood located within Eagle, Colorado's? Eagle Ranch community.? There are currently many excellent buying opportunities in Aidan's Meadow for those that appreciate quality and value.? The duplex and single family homes are situated around a neighborhood park and along Eagle Ranch's golf course. There are presently 8 homes listed for sale, ranging in price from $454,000? to $738,900.? 10 Bunker?Way, listed at $454,000 for approximately 2343 square feet, ?is a "short sale" and represents a significant value:? the original purchase price was $614,900 in August of 2006.? There is one duplex home listed for sale, 450 Palmer Loop, priced at$475,000 for approximately 2530 square feet.? It was origianlly purchased at $613,900 in April of 2008, but it is not a short sale and has approximately $60k in upgrades. Read more about Buying Opportunities in Eagle Ranch's Aidan's Meadow! Fun Restaurants in Eagle, Colorado! Eagle Colorado has many fun restaurants, each with its own feel?and excellent food.? After playing golf at Eagle Ranch or biking on one of the many bike trails in the area, swing by one of these fun, family restaraunts to wet your whistle and grab a bite to eat. Located in the heart of downtown Eagle, the Broadway Cafe delivers great food in a comfortable, historic atmosphere.? Recently remodelled, it retains a charming?older feel yet the food is anything but stale!? Sit inside or out, just be sure to go there.? And be sure to try the crabcakes! Read more about Fun Restaurants in Eagle, Colorado!